And yes, as you can see on my previous post last night, I just celebrated my 20th birthday last Sunday. To tell you the truth, I honestly don't know what to expect on this day because I really got too preoccupied juggling school, on-the-job training and Sister Secrets. But before my birthday came, I know i'll be trying bowling with Jonas at SM Southmall. My dad used to play this sport but I never got the chance to try it myself. But now, I believe that it's the right time to try out something new since I'm turning 20. If you haven't tried playing bowling at SM Bowling Center yet, I'm gonna give you a glimpse of what to expect when you go inside the Bowling Center. First, you gotta tell the person in the control area how many are playing in your group. Every head costs 175 pesos per game. Take note, that is inclusive of the bowling shoes already. Then, if you want another round , the next game will cost you 145 pesos only since the shoe rental is 30 pesos. After giving your details at the receiving area, they will ask for your shoe size so that you can change your foot gear to bowling shoes. You also get to pick the ball that you will use on your game. The good thing is, you get to pick as much balls as you like. It has different sizes that's why you have to pick what size suits you best. SM Bowling Center revolutionized the tenpin bowling in the Philippines as the first to use a fully computerized and automatic scoring system! I know, how cool can that be? So this is the wrong way of playing bowling, okay? :) I don't know the right stance yet but i'm really enjoying the whole thing. There are times when I get to hit 7 out of 10 pins and i'm happy about that because it's my first! But this guy striked the ten pins! Ugh, the competitiveness in me begins to rise! It was a good game for the both of us! I know i'm gonna go back because I had tons of fun. But i'll make sure that the next time, I go back, I know the fundamentals of Bowling. Maybe try to do a little research about the sport first. Haha! Next stop, Burgoo! Since we got hungry trying our best to do that strike, it's now time to dine in somewhere. Well Burgoo isn't my original choice, I had to pick this one because almost all of the diners in the Food Street are jam packed since it's Mother's day. I really want to try Sambokojin but I cannot handle how full the place was because of the said location. Thank God there is no much waiting time in Burgoo for we are really hungry! By the way, this is also the first time that I would be eating at Burgoo. I've seen its branches in lots of areas but I never got the chance to dine in. So yay for another first! I love the fact that customers can doodle, draw or write something on the cover table while waiting for their food. Bottomless Lemonade for less than 70 pesos. I think it's quite good. But presentation wise, nyay. I love the feels that this place brings in me. I feel like I'm eating somewhere in the US. Haha! The restaurant is quite full since it's Mother's Day. But good thing that the place itself is not overcrowded. After waiting for like 30 minutes and up, our order has finally arrived! Burgoo Kebab. Skewered pork marinated in special Kebab sauce. This is served with grilled onions, bell peppers, corn and mashed potato. Cost us 495 pesos for the large order. This platter is to die for! The moment I had a taste of the Mashed Potato, it was like a piece of heaven because of it's yummy garlic and potato taste. Plus the skewered pork were so tender that I really can't get enough of it. I am a sucker for corns. That's why what I did was later on, I shred the corn kernels and mixed them with the Mashed Potato. Great combination I have to say! Pizza Sampler. Combination of 4 different pizza flavors of our choice. Cost us 475 pesos for the regular pizza. The attendant didn't asked for what flavors that's why they just surprised us with this 4 unique flavors. Since I haven't tasted yet any of their pizzas ever, i'm excited to try out this 4 exciting flavors. Each flavor had their distinct taste that made me pig out for another slice after each one bite. I like the fact that the pizza also has generous servings of cheese which made this pizza oh-so mouth watering. I have to say that the money we spent for our dine in at Burgoo is definitely one for the books! I am definitely coming back soon! The last thing I did in my day was to spend the rest of the night with my closest friends who lives nearby. Most of them are my High School friends while some of them came from the neighborhood. It's such a sight to see that majority of the people who are closest to my heart are on the same venue to celebrate this special day. Everything was beyond expectation that's why I know that this will be a night to remember. To end this post, I would like to share with you the most special gift I received on this day. 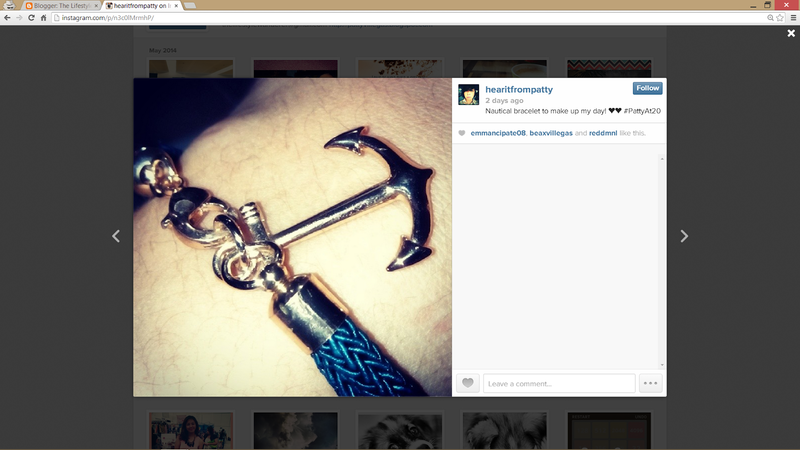 I immediately fell in love the first time I saw this nautical bracelet. Can you guess who gave this one?